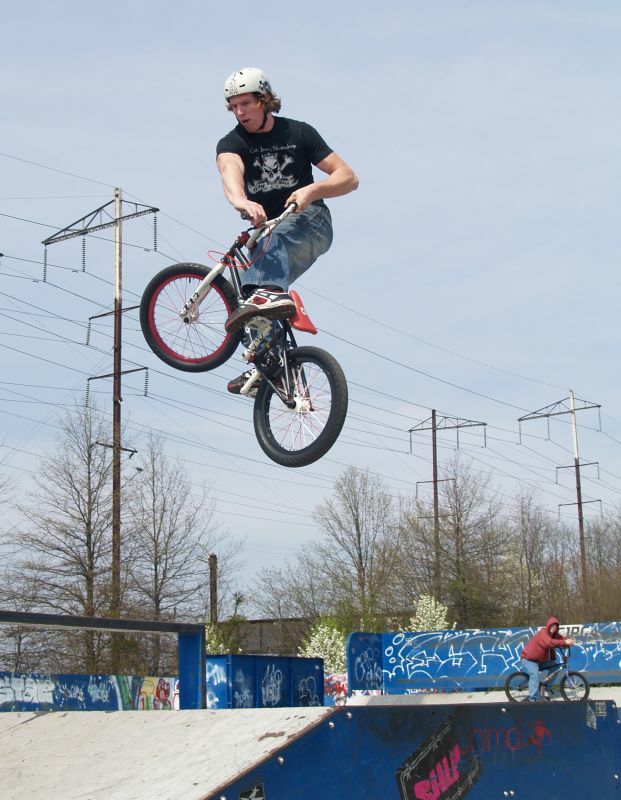 A year ago I was covering one of the many Hackettstown events and noticed this huge dude shredding on the BMX. 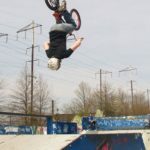 He seemed like a decent enough guy and after slamming his knee into the side of one of the ramps and stepping out of the comp so he wouldn’t stress the injury, I struck up a quick conversation with him. (I’m also a veteran of the “let’s cut open your knee and fix the damage wars) At that comp he bowed out of his second run intelligently thinking long term instead of hammering himself for one more run at the comp. Unfortunately I had completely forgotten his name. Now the man has been on the site and in the zine in countless photos but it wasn’t until this past winter that I finally got his name. John Ritchie “Condor”. It’s not hard to miss him as he’s 6’5″ and usually at least that high in the air. 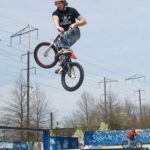 John The Con-dor has been on the scene for about 5 years and in that short time has really come out and stomped his name into the upper echelon of the local pro-am class. It wasn’t always that way though. Much like all of us when we are young, John looked up to the older local shredders in the neighborhood he was from and wo always be around ’em practicing. Well as the older guys have a tendency to do, they would bust Ritchies chops and tell him, “look kid, come back next when you can pull (insert crazy trick here) and maybe you can chill with us”. The locals jokingly referred to John as ‘Condor” due to his nice bright white Hoffman Condor bike that he would tool about on. Well John would take off and return the following week. 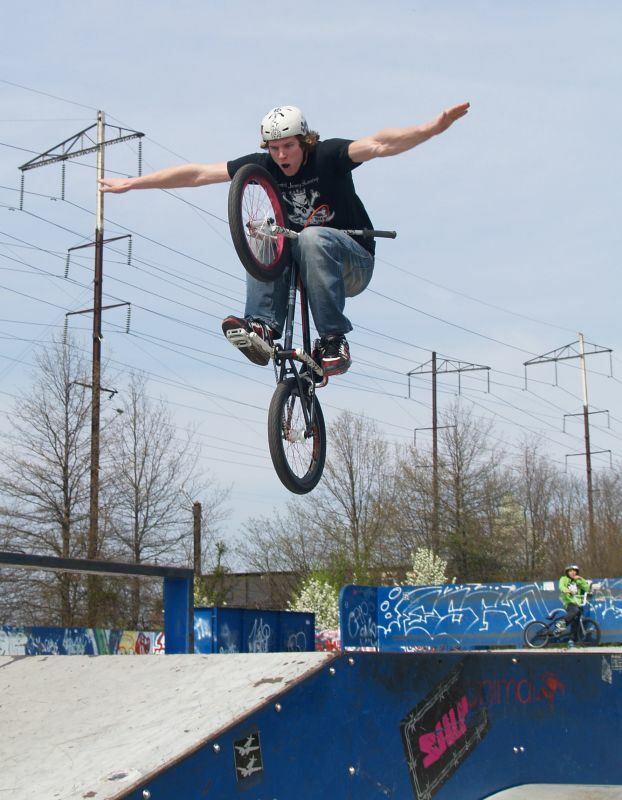 But the hometown heroes were suprised that not only did “Condor” learn the trick…he normally upped the ante. So week after week, Ritchie was told come back and learn this….and well…the man did. Overtime, the student became the master and now as we all see at every comp he attends he’s the one that local kids are looking up to. Which is the way it goes. 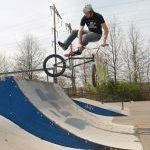 With backing from Alienation, CJS BMX and Skate and Valor clothing, NJ’s own Condor, John Ritchie will be out there tearing up the comps, jams and video parts this year. If you seen John out there ripping on his ride this year or hanging with some of his buds like Zack, Hambone, or Mark, walk up and say hi. 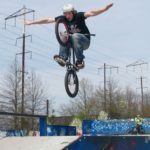 He’s always repping BMX and the scene itself in a positive light which is probably why he wanted me to end this short bio with a shout out to all his buds that he rides with and of course his parents. 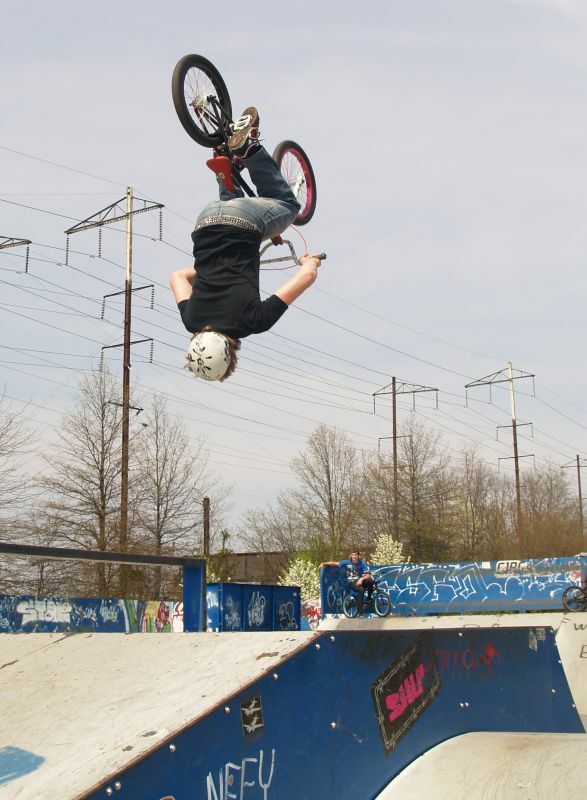 Check some shots of Condor right here from me and the main maniac Mike Kuhn! Ride on John and CJS! !